The Cary Leeds Center for Tennis & Learning offers a full range of Junior Pathway Programs for kids ages 4-18. Each program is designed to improve player skills using age appropriate equipment and ensuring transition throughout the NYJTL pathway. All levels are lead by a staff professional, dedicated to providing the highest quality of tennis training to ensure success. Meet the staff here. Daily round trip transportation is available. Cost per session is $425 round trip from pick up and drop off points, and $680 for door-to-door. 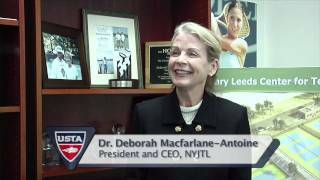 Contact us at cltransportation@nyjtl.org for more information. Our goal in the Development Level is to teach students how to play tennis. We use a “Game Based Model” (GBM) that introduces skills as part of playing the game. We follow a youth progression pathway that uses low compression balls (red, orange, green and the traditional yellow), proper sized courts and equipment and modified scoring that enables children to play tennis faster. The program is designed to introduce tennis and improve children’s self-confidence and athletic skills while they learn basic tennis technique. Our Tournament Team Program is designed to help players ages 8-18 develop the necessary skills to be successful, competitive tennis players. Team members receive instruction and practice learning effective technical, tactical, and mental skills. Our emphasis on physical training is specific to tennis and includes improving footwork, flexibility, agility, and core strength.